A stressed romantic comedy set in a dramatic post-war environment, A Foreign Affair creates an intriguing context but gets caught reaching for an unsuitable level of frivolity. A bombed-out Berlin, just after the end of World War Two. A US congressional committee led by prim and proper Iowa congresswoman Phoebe Frost (Jean Arthur) arrives to investigate troop morale. She is soon exposed to soldiers fraternizing with local woman, and in particular gravitating to a popular cabaret where sultry singer Erika von Schlütow (Marlene Dietrich) performs. Erika has a dark past with strong connections to the highest echelons of the Nazi party, but is currently surviving by carrying on a secret affair with Captain John Pringle (John Lund), who is also from Iowa. Phoebe insists on investigating Erika, not knowing that Pringle's commander, Colonel Plummer (Millard Mitchell), already has the singer under observation in the hopes of smoking out a high ranking Nazi still in hiding. Pringle worries that Phoebe's meddling will expose his affair, so he feigns a romantic interest in the congresswoman, melting her heart and creating a complex love triangle in the destroyed city. Directed and co-written by Billy Wilder, A Foreign Affair is visually attractive, but otherwise more curious than successful. The grim setting of a Berlin in ruins hosting emotionally shattered locals and a bored occupying army creates fundamentals for a hefty drama. Instead Wilder half-heartedly steers towards comedy, and the playful elements are never at ease within the dour context. The film's conflicted core is typified by the two women at the heart of the story. Erika rules at the smokey, rowdy cabaret, and Dietrich gets to perform three melancholy numbers inspired by a broken city and its demoralized people: Black Market, Illusions, and The Ruins of Berlin. Her character is world weary, dealing with a glorious but destroyed past and an uncertain future. In contrast Phoebe Frost is a cartoon figure, starting out in humourless headmistress mode and transforming into a puddle of goo melted by fake romance. 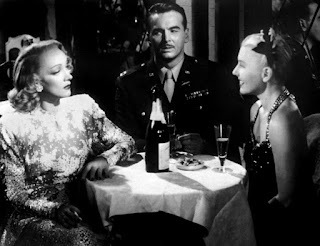 It's no fault of Jean Arthur, who does well in the role, but Frost is a ludicrous character with no credibility, dropped into a grieving world. John Lund in the role of Captain John Pringle does not help matters as all. Singularly lacking in charisma, it is difficult to imagine one woman even pretending to be attracted to him, let alone two at the same time. Buffoonish congressmen and the barely sketched side story of a Nazi coming out of hiding further erode enjoyment. It is left to the prevailing mood and on-location cinematography to rescue the pleasures of the film, and Wilder and cinematographer Charles Lang do not disappoint. The mountains of debris on every street corner and the bombed-out buildings still serving as housing for shell-shocked Germans are captured in their destructive majesty, with plenty of crisp nighttime scenes making the most of the black, white and grey austerity. A Foreign Affair is an uneven effort, a laughing-in-the-graveyard exercise where the fun falls flat but the prevailing aesthetics impress nonetheless. John Lund lacking charisma? Are you kidding me? 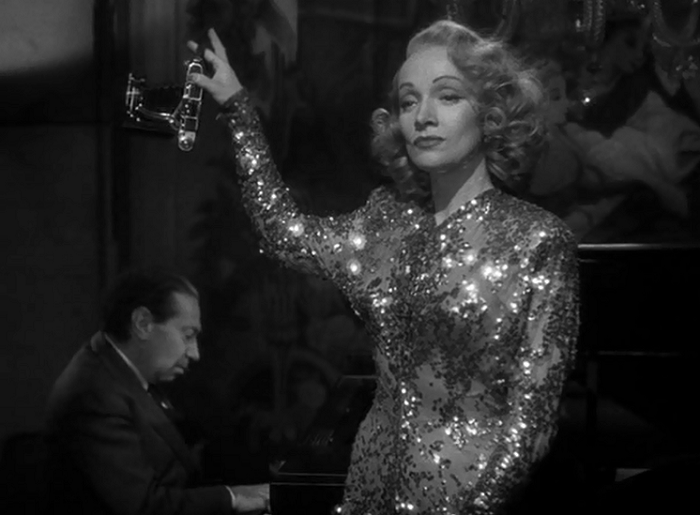 The movie would be sorely lacking without him, and the chemistry he had with both Dietrich and Arthur. He was a brilliant, underrated actor, quite good at handling comedy as well as drama.